I finally got it up, friends! 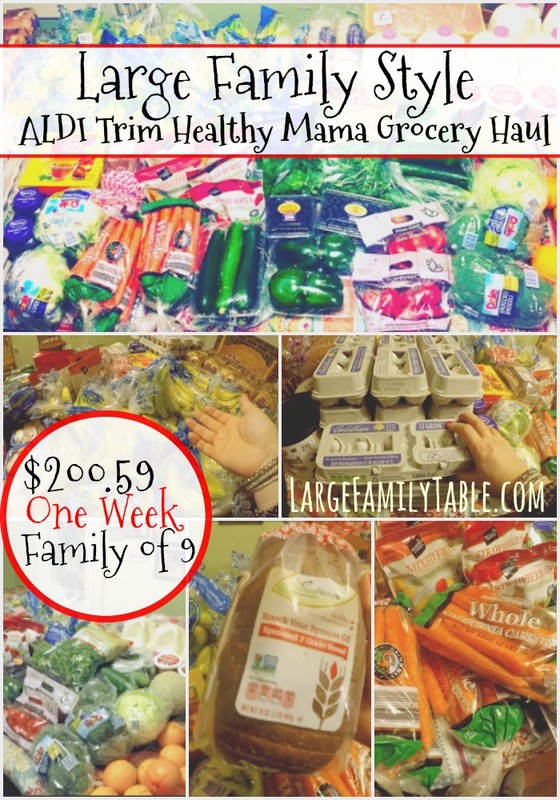 Here’s my full Large Family ALDI Trim Healthy Mama Grocery Haul | Plus, One Week Large Family Meal Plan on YouTube! Below you’ll find the entire cost breakdown. My total came in at $200.59 which actually includes the 4th package of chicken I never received (a double-charge). Even still that breaks down to $22.28 per family member for the entire week! If you’re new here, we’re a growing family of nine from 6-foot tall teenage boys down to toddlers plus my 6 foot 6 hubby and my hormonal pregnant self who also homeschools and works from home. This means we have all our meals and snacks at home for the most part. So long story short, that’s a lot of food! There are two main lunch plans for this week. The first plan is to eat up any dinner leftovers from the night before. We’ll also have a “lunch buffet” where we’ll bring out all available fruits and vegetables and quick items so each family member can make their own healthy lunch plate. 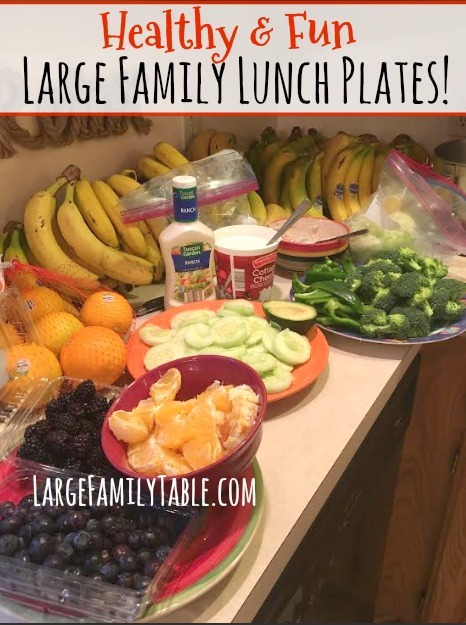 For our “lunch buffet” we had blueberries, blackberries, oranges, cucumbers, avocado, sliced green pepper, sliced broccoli, cottage cheese, lettuce (left from prior grocery haul), and tuna salad (couple cans of tuna left from prior grocery haul), and ranch to dip as needed. Slow Cooker Chicken Broccoli Alfredo Recipe – This is always a winner. Foil Packet Burgers – add cheese, mushrooms, onions, whatever you’d like! Lots of flexibility with this one. Slow Cooker Italian Chicken – this also works well with a pork roast. Leftover Night – I’m sure we’ll have one! Large Family Weekend Chili – for the weekend I’ll do a large stock pot full of chili and homemade cornbread. You can see how our weekend chili turned out here. 8 lbs of Carrot Sticks (Here are my Amazon referral links for the similar storage container that I use for our bulk carrot sticks. These are the smaller size containers I also mentioned.) You can read here about how we keep carrot sticks fresh for a week or more! Hard Boiled Eggs – We’ll boil up a dozen or two just for a quick protein packed snacks. Broccoli/Cauliflower/Green Peppers – all of which will be sliced and ready to go in the refrigerator. Special bread from the bread machine (I try to keep several loaves of banana, blueberry, or pumpkin bread in the freezer). Here’s how I do easy banana bread in the bread machine. Here’s a view on Instagram of how our bread machine moments can look! Here’s my full Large Family ALDI Trim Healthy Mama Grocery Haul | Plus, One Week Large Family Meal Plan on YouTube! You might also be interested in my Large Family Grocery Budget from 2015 (need to update this soon because of the stores where I shop have changed, but the actual budget has not). 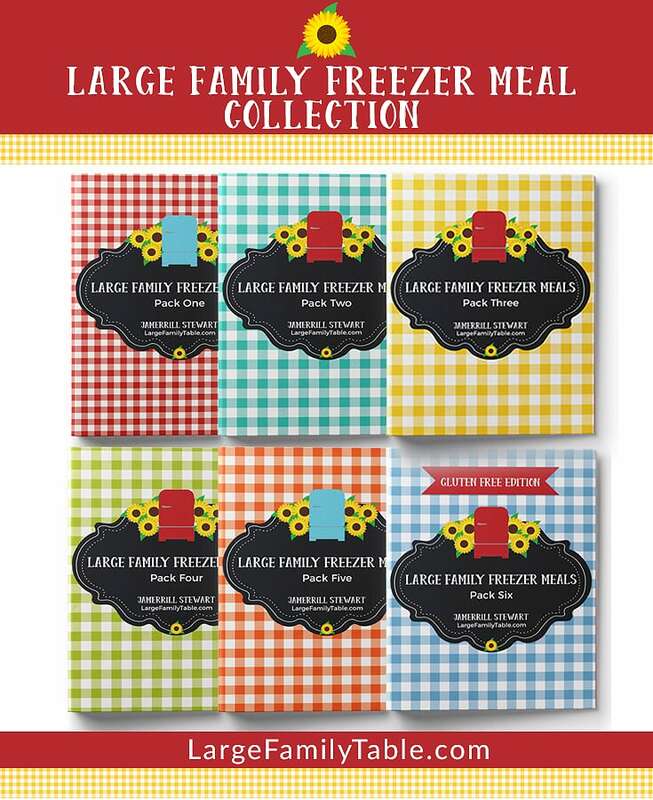 And here’s the free family meal planning collection! I have some more ideas for fast meals for large families. Really shortcuts for things that large families often miss out on because of time consuming task to make one or two at a time. For instance, using a cookie sheet you can make 6 or 8 toasted cheese sandwiches at once in the oven per cookie sheet. While your tomato soup is warming on the stove. You could probably even use your cooking spray, or baking paper to reduce the amount of fat on the outside of the sandwiches. But place your sandwiches on the baking sheet and bake at 325 f until golden then flip and brown on the other side. Remove from the oven and serve. I love this idea! Everyone likes grilled cheese but I dread making it because it’s such a pain to make for a crowd. Trying this on Friday I think! You are an inspiration and I love your, youtube videos. We are having a taco night. 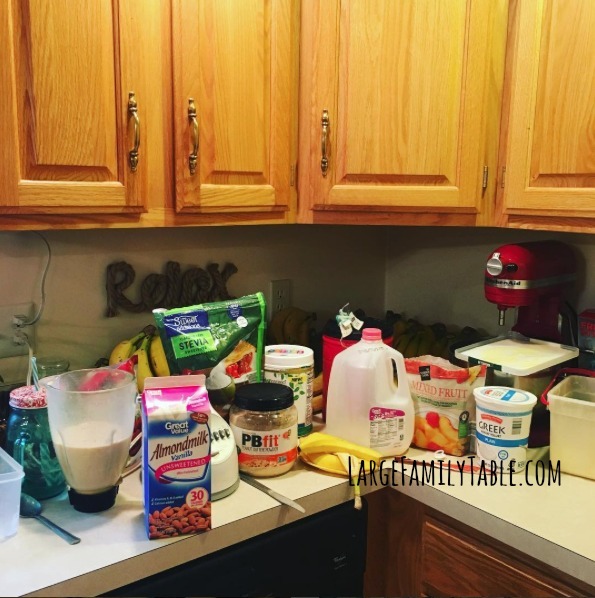 Jamerrill…..I am interested in making smoothies a part of our morning meal. What are you using to make yours? I have been looking at soy protein powder and it is overwhelming how many different kinds and how much they cost….ugh!!!! Where can I get some at a reasonable price and what brand should I look for? I would love your input on this. I seem to be stuck in the scratching my head stance…lol!!!! Chris, I hope you won’t mind my unsolicited post… please do your homework on soy. It can be a hormone disruptor, among other negative things. There are lots of great whey protein powder options out there that are safer. We especially like Vitacost as a less expensive online supplier. Good luck! I’m sure they’ll refund you . They’ve always given me great customer service . Jem, here’s a recipe for zucchini slice that your family might enjoy. Great served hot or even better the next day cold with salad or vegs 🙂 Enjoy! In a large bowl, combine grated zucchini, onion, carrot, cheese, (all grated) flour,(self raising ) oil, and lightly beaten eggs. Season with salt and pepper. Pour into a well greased baking tin (or you can line tin with baking paper, much easier) Bake for about 30-40 minutes, or until well browned. Cut into slices and eat! And here’s a recipe for radishes too! 1.To make the Roasted Radishes, trim and clean the radishes and cut in half lengthways. 3.Once cooked, (about 10-15 minutes), remove from oven and sprinkle chopped chives on top to finish. Oh, this sounds great! Thanks so much! What day of the week do you go shopping at Aldi? I’ve gone several times and they were out or very short on things. Is there a certain day that they restock? Yes, ask. We go right after their produce comes in ,otherwise it gets either sold out or overripe . I never go in the evenings , either. Coming over from MSM… I also have a family of 9, shop at ALDI and do TrimHealthyMama. So we have quite a bit in common! I’ve had the occasional overcharge at ALDI, probably due to them going SO FAST when they ring us up! They’ve always been great about refunding me.